Woodbrooke-on-the-Road is our travelling teaching service. Our workshops can be tailored to meet the particular learning and spiritual needs of your meeting in the convenience of a location where you are. 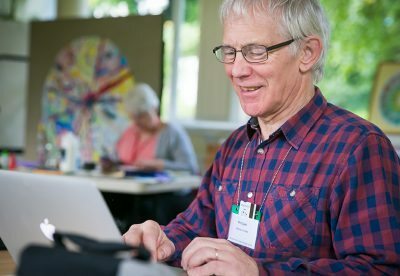 Our team of experienced tutors offer a range of specialised and accessible workshops covering Quaker history, theology and testimony. We can help you to explore the building blocks of a faithful community; from nurturing the spiritual life of the meeting to equipping Friends to serve the meeting by taking on Quaker roles. Work with experienced and skilled tutors. Offer convenient and accessible learning. Access Woodbrooke learning in a way that’s affordable, with bursary funds and special offers available. Open itself up to the wider community. Meet and share with other Friends. Nurturing Our Quaker Community (including training for Quaker roles). Exploring the living Quaker tradition. You can book a workshop by phoning us on 0121 415 6785 or via email learning@woodbrooke.org.uk.